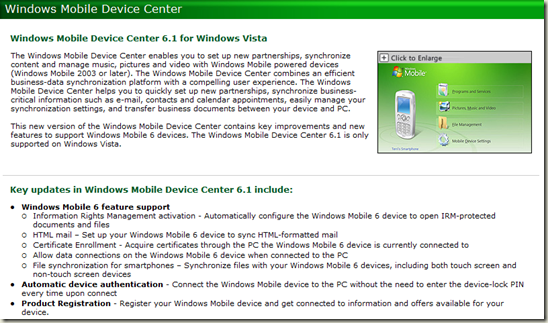 Last night I spent a frustrating hour or so messing around with a HTC TyTnII and the Windows Mobile Device Center under Windows Vista. 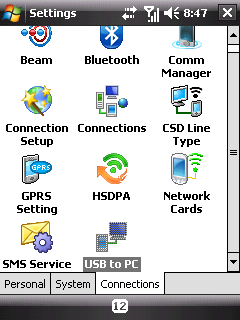 You would think, brand new Windows Mobile device (running WM6 of course) + Windows Vista (with all the latest updates installed) would be able to connect, sync and browse the internet via the USB connection. Think again. Unfortunately, despite continual discussions between the community and Microsoft we don't seem to be making much progress in making this easy for the end user. Yes, I know there are forums out there talking about all the things you need to try before sending the device back to the manufacturer but the reality is that as a consumer experience this SUX. Anyhow, instead of just ranting about the evils of the WMDC (which increasingly reminds me of searching for WMDs in unstable territories....) I thought I'd list a couple of the tricks I use to try and get things to play ball. Q: I've plugged my device in and opened the WMDC but it never seems to connect. Look out for "Connecting" on the device - for some reason WMDC can be really slow to detect the device and can take upward of a minute in some case (long enough for you to think it hasn't connected). 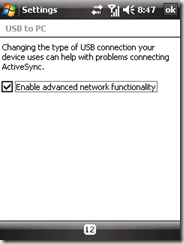 When the device shows "Connecting" on the ActiveSync screen it is actually trying to establish the connection - when this stops it should read Connected at the bottom, if not, you have a problem. Try a different usb port. I've found that sometimes WMDC gets all confused and refuses to communicate through a specific usb port. Simply changing to a different port can be enough to get it to work. Funnily enough in most cases I've found that you can then change back to the original port and it works fine - go figure! 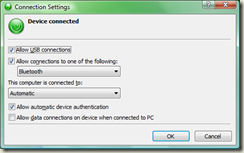 Try adjusting the Connection settings on wmdc - Change the "This computer is connected to:" value from Automatic to Internet and click Ok. Quite often this is enough to convince the WMDC to drop existing connections and re-establish them. Again I don't know why, but this does seem to work. Kill the WMDC process - Task Manager is your friend - open it and kill the wmdc.exe process. Make sure you disconnect your device from the usb port first just to be sure. Q: My device is now connect to WMDC but I can't browse to internet sites on the device. A: My first response to this is to get yourself a decent data plan and then to use that instead of using the internet connection on your computer but I understand that this isn't a great option for people using "expensive" carriers ;-). As such here are some pointers to get this to work using the WMDC. Make sure you are running the latest version of the WMDC. No this doesn't mean looking in Windows Update as for some reason it doesn't show up there! 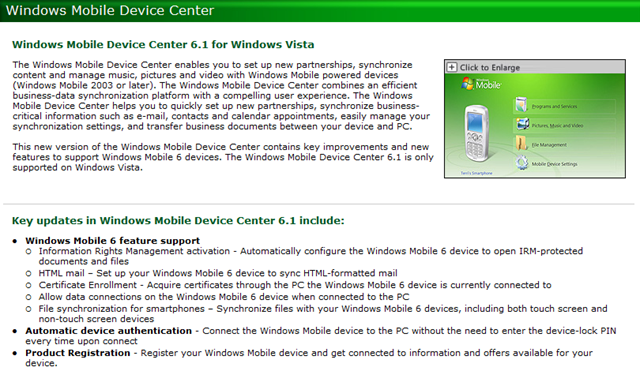 Go to the Windows Mobile Device Center for Vista website, scroll down and select the appropriate update. Note: The filename of the download is "drvupdate-x86.exe" - please make sure you rename this so you can find it later - don't spread the plague of rubbish filenames! Disable advanced network functionality on the device. 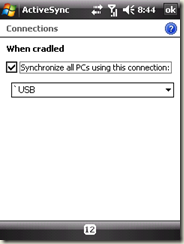 Go to Settings--> Connections and select the "USB to PC" icon (first picture below). Then uncheck the "Enable advanced network functionality" option. Whilst this might be advanced functionality under ActiveSync, it generally just causes problems using the WMDC. Ok, so if you are still having issues it might be worth getting hold of your local Windows Mobile MVP and asking them what you can do. Before I go, I'd like to talk through how I have my device setup. Firstly, I don't sync anything with by local machine, everything is sync'd to Exchange 2007. Instead of managing our own mail server all my SoftTeq mail goes via a hosted service (http://www.myhostedsolution.com/) - for $10 (US) a month I get as much storage as I want and never have to worry about maintaining/backing up. It also gives me the ability to not only sync to as many devices as I want, worldwide, it also gives me the ability to control my devices (remember that Exchange 2007 has the ability for the user to self manage their devices - it ability to remote wipe etc), and of course has webmail access. The next thing to note is that I recently moved across to the 3 network. Whilst their coverage isn't great outside the metro areas (and data is painfully expensive when it falls back to GPRS), inside the metro area I have found the reception to be good and the data is still the cheapest on the market. I have a device (the HTC Touch Dual) without WiFi as I found it frustrating to use WiFi because you don't have the ability to have Push Email and it just drains the battery. The result is that all my syncing is done via the 3 data plan. Now talking of battery life, the HTC Touch Dual battery life royally sux. If I had to use the device without charging I think it would last less than a full day. That said, I'm never away from my computer for more than a day, so I'm just in the habit of carrying my usb to device sync cable with me. This is the only way I charge my device. Unfortunately the default settings on the device will mean that even if you are religious about plugging your device in every time you sit down, you will still see the battery gradually diminish. 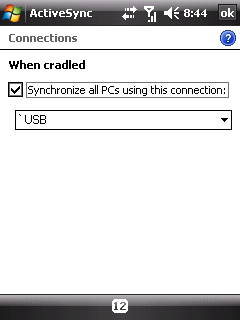 The reason for this is that by default it is setup to sync to the WMDC (or ActiveSync) upon a Usb connection being establish. This means that the device is periodically brought out of standby and never seems to return to standby. Even with the backlight set to dim, this will drain the battery almost as fast as it is charging via usb. 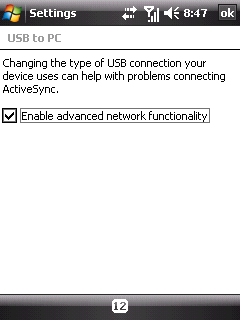 Since I don't actually sync through my computer, I actually disable the sync with WMDC (within ActiveSync on the device, select Menu, Connections and then uncheck the "Synchronize all PCs using this connection:" option - see image below). Now when I connect my device, I hit the power button to make sure it stays in standby - for some reason connecting the usb cable will wake up the device even with the sync option disabled. The device will remain in standby, optimising the recharge speed - it's typically back to full power in 10 mins or so. 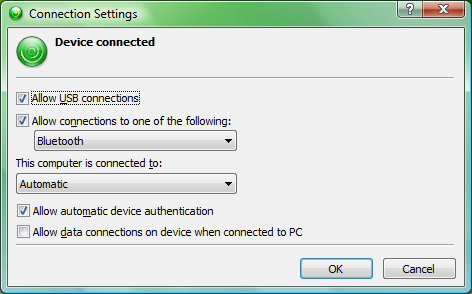 The downside is that with the sync option disabled, you can't connect to the device using any of the developer tools. So to do development I have to disconnect the device, toggle this option and reconnect - how frustrating, but better than lugging around a brick when the battery runs out. SideNote: The device images on this post were taken using the SOTI Pocket PC Controller which is available via YouPark.